Hurricane season is here, which means you may soon see Catholic Charities' Shari Bernius (pictured above) on your television. 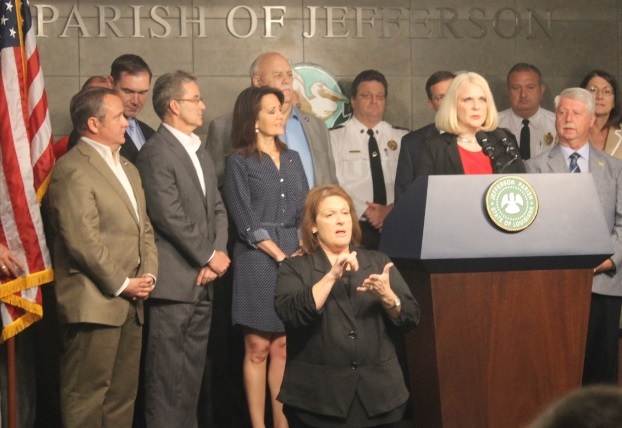 Bernius, the Administrator at Catholic Charities' Deaf Action Center, is known to many for providing sign language interpretation services for press conferences during times of emergency and disaster. Leading up to and during hurricane season, Bernius and Jennifer Guerrieri, who serves as the Interpretation Coordinator at the Deaf Action Center, participate in mock evacuations and educate staff on the needs of the deaf community in case they encounter a deaf individual during an actual evacuation or emergency situation. However, hurricane season only represents a portion of the work done by Bernius and Guerierri at the Deaf Action Center. Read the full story to see how they're giving voices to the voiceless. This July 4th weekend, the Peace League of New Orleans will host its third annual Youth Peace Summit and Basketball Tournament! 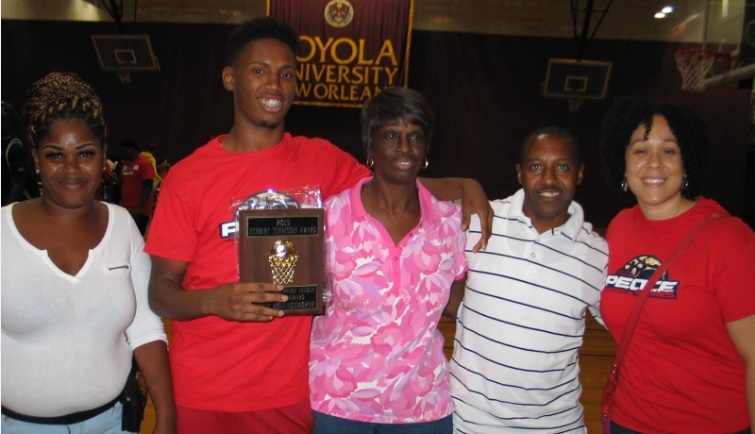 The New Orleans Peace League offers a free basketball league for young men in combination with life skills coaching. The Youth Peace Summit and Basketball Tournament is the two-day culmination of the season, mixing tournament-style playoffs with guest speakers, discussions and workshops. Learn more about the League and this year's tournament. We are still in need of volunteers for this year's tournament! If you are interested in helping with sign-in, serving snacks and drinks, set-up or clean-up, please contact Kristina Gibson at (504) 310-8772 or kgibson@ccano.org. Frank Reeves has been volunteering as an assistant instructor with our English as a Second Language (ESL) classes since the program began at the Church of Christ. He spends about eight hours a week with students, checking homework, explaining concepts and providing the encouragement and support they need to conquer a new language. Read the full story to see why Mr. Reeves volunteers with ESL. You can volunteer with ESL, too! Learn more about our ESL program to see if you're interested. You must be able to commit to 3-6 hours per week for one semester. Catholic Charities Archdiocese of New Orleans is excited to announce a new addition to our website! The new Share Your Story page allows clients, donors, volunteers or anyone else affected by the work of Catholic Charities to share their story with us. You can read more about our new Share Your Story page and start sharing today. We can't wait to hear from you! Hurricane Season officially began on June 1 and lasts until November 30, 2016. The best way to ensure your family's safety is to be prepared. The city of New Orleans and Mayor Mitch Landrieu are dedicated to making sure that everyone is prepared this hurricane season. Visit their website for guidelines on what to do before, during and after a hurricane. Thanks for showing your heart! Thank you to everyone who participated in our Special Second Collection at church parishes February 21-22! Thanks to your generosity, we raised $258,055 to be used serving the most vulnerable in our community. 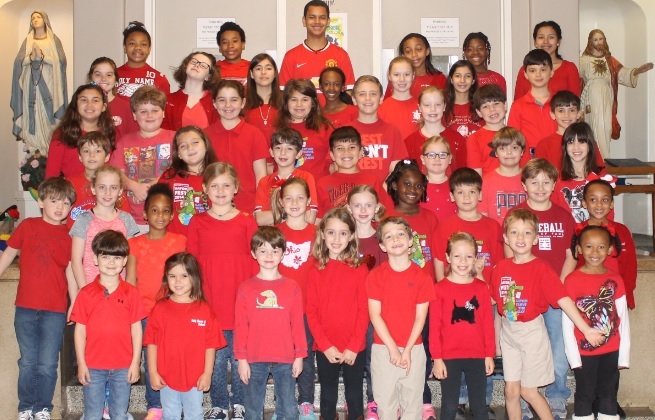 We would also like to thank all of the students, faculty and staff from around the Archdiocese of New Orleans who participated in Show Your Heart Day! Those who donated $1 or more were allowed to wear their favorite red shirt to school on February 19. Show Your Heart Day raised $13,380 to help those we serve!